You planned, you researched, you waited, and now your brand new Instant Pot pressure cooker has arrived! You stare at the box. It stares back. If you are on the fence about getting a pressure cooker, here are some reasons why you should consider a pressure cooker. If you already have your Instant Pot and haven't used it yet, here are some reminders why you purchased it. *If you are ready to start, scroll down to RECIPES. Fewer Dishes to wash. Everything is done in one pot. Fool proof, with the right, tested recipes. Keep your kitchen cool in the summer. Proof your bread dough in the winter. Can cook two dishes at once, using meat in the bottom and a bowl with veggies or rice on top. Can cook from frozen. Soups and meats can be frozen and cooked right in the pressure cooker, saving time thawing out in the fridge or microwave. You can walk away once your cooker has reached pressure. Clean the kitchen, or better yet, play with the kids, dog, or watch your favorite tv show. After cooking your foods will stay on the Keep Warm setting (145°F) for up to 10 hours. Safe. This is not your grandma's pressure cooker! 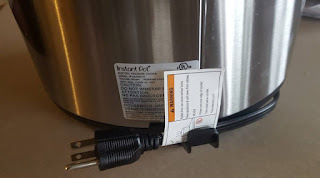 Instant Pot has 10-11 built in safety mechanisms built in. It will not come to pressure if your pot is too full, doesn't have enough water, or if your lid or pressure valve isn't completely closed. You won't be able to open your pressure cooker until ALL of the pressure has been released. 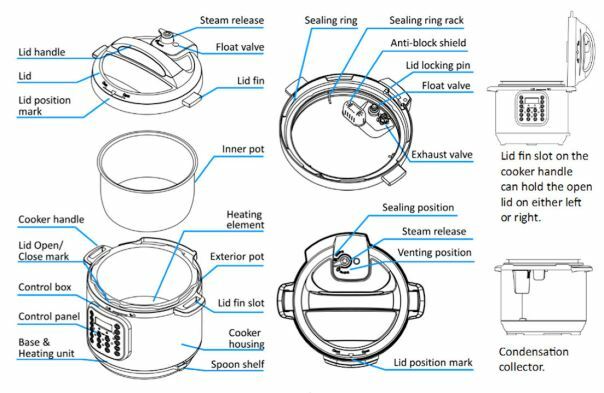 The Instant Pot has a locking float valve that "drops" when pressure is released and allows you to open the lid. Many recipes have food cooked above the water, allowing it to keep many of its nutrients, vitamins and minerals. Tenderizes tough cuts of meat. Foods that have long cook times on the stove or oven can be made in the Instant Pot in a much shorter time, as much as up to 70%. No standing over a pot on the stove, stirring, simmering, or roasting in an oven. Use less water, which takes less energy to heat, allowing pressure to cook your food. Save money over eating out or buying prepared, ready to eat foods. If you enjoy yogurt, you will find a HUGE cost savings by making your own. It's easy and tastes SO much better than store bought yogurt. Ok! 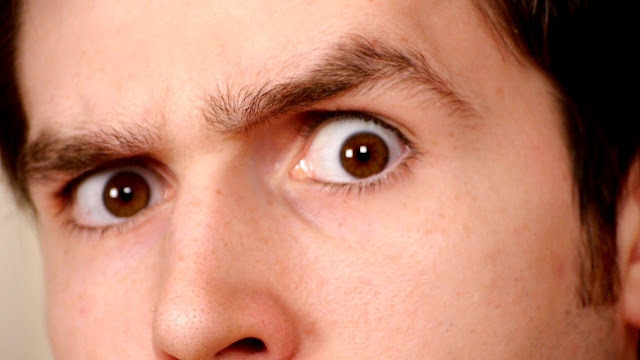 I have convinced you to get a pressure cooker, and now that it is in your home, it's time to end the staring contest! Yes. Open the box. That is your first step. Really! 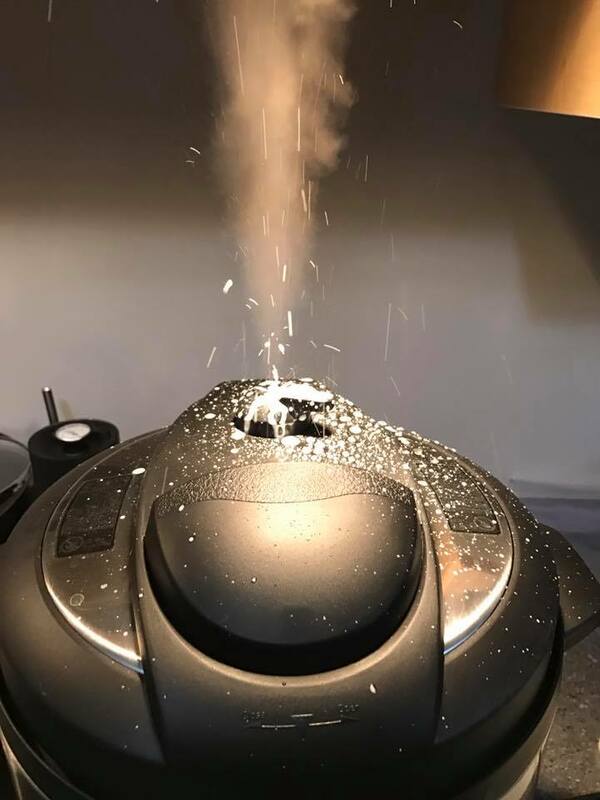 It's important to get to know your pressure cooker, before you start cooking. Give your Instant Pot a name, a personality and start bonding! I know, I know... you're excited and you want to get cooking, but read the manual, watch some YouTube videos, OR continue reading this article. You don't need to memorize and there won't be a test. But it is helpful. "Thingamabob" and "Whatsit" names will not work, especially if you have a question about your cooker. Practice putting it together & taking it apart: attach the plug, remove/insert the inner pot, silicone ring & lid. All the parts are important, but some are more important than others. Steam Release valve: This keeps the pressure inside the cooker. It snaps on/off. Yes, it is wiggly, but should stay on, even when your lid is turned upside down. Sealing Ring: This helps keep the cooker sealed while in use. It must be pushed in firmly, allllllll the way around. 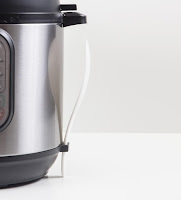 This plastic cup snaps on/off the back of the Instant Pot and is used to collect any water/condensation that forms during cooking or coming to pressure. Check it every so often and clean as needed. Lid Fin: This is actually pretty cool. This "fin" goes into the fin slot as a place to put your lid after opening your pressure cooker. You will want to remind family members that this is not a hinged lid and will break if not removed properly. Ultra Model: This model has a separate Steam Release button. The Ultra automatically seals and this button allows you to quickly release steam without risk of steam touching your hand or fingers. Rice Cup - this is not a true 1 cup measure and is only for rice. I've never used it. Spoon, ladle - eh. I have my own and haven't used these, either. Important Things to Know before you start! *Do not place your Instant Pot, lid or parts on the stove. Knobs get bumped and pots get burned. *Check to make sure the stainless steel inner pot is INSIDE your cooker BEFORE pouring liquid or foods into the cooker. Liquids can get into the electrical components at the base of the cooker and potentially ruin it. If this happens, contact Customer Support. *While the cooker is in operation, do not place your face, fingers or skin over the pressure release valve. Do not put a towel over the pressure release valve. *Do not force the lid open while the silver float valve (pin) is up. Wait until it drops down before opening. 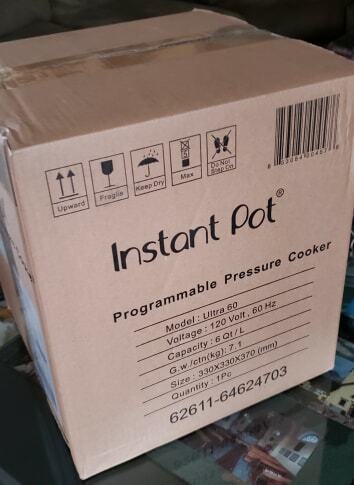 *The Instant Pot is not "instant." Plan on adding some time (30 min) to the time stated recipe to allow you to figure out the recipe, prep, and cook the food. So Many Buttons! What to Do?? Tell yourself it's ok. Don't look at all the buttons. In reality, you many not use all these buttons. Personally, I only use the following: Pressure, Saute, & Yogurt. If you have the LUX model, you will only have High pressure. If you have a Duo, or other models, you will have High & Low pressure settings. *Some pressure cooker recipes will say to push the MANUAL button. This is on older models and has been replaced by the PRESSURE button. Manual/Pressure is one consistent pressure (11.5 psi). You will hear "clicks" coming from the cooker, and this is perfectly normal. The cooker is regulating the temperature to help maintain a consistent pressure for cooking. The majority of recipes will ask for HIGH pressure. I use LOW pressure for hard boiled eggs, seafood, delicate veggies (ie. broccoli) or lean meats (pork tenderloin). The following settings use NO pressure: Saute, Keep Warm, Slow Cook & Yogurt. You don't have to use the Instant Pot pressure lid and instead, can use any lid from your pots/pans that will fit or purchase an Instant Pot glass lid. Why does the Instant Pot have Presets? These are pre-programmed settings and have variable pressure, which the cooker regulates the temperature of the food...the higher the temperature, the higher the pressure. I don't use them and instead, use the pressure and cook times as indicated in the recipe. Less 221°F - simmering, sweating onions, mushrooms, etc. Slow Cook - doesn't use any pressure. 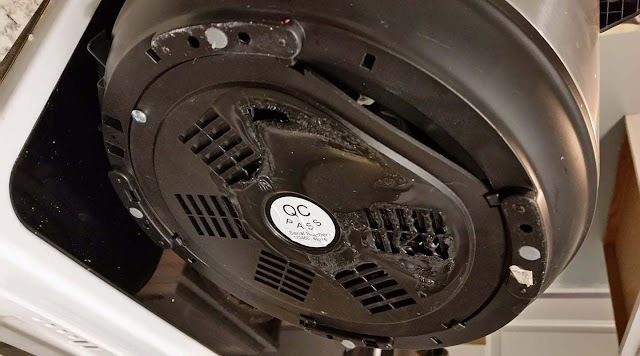 Use a glass lid or open the vent on the Instant Pot lid. I don't use this setting as pressure cooking gives me great results in a short time. Steam - uses high heat to reach pressure quickly, and needs foods placed on a trivet, with water under the trivet. Rice - This preset is for WHITE rice only. The time is automatic, depending on how much rice is used. After you select the Pressure setting (High or Low) , you will want to use the [+] [-] buttons to determine the cook time. Use the cook time stated in the recipe. For many recipes, while the pot is coming up to pressure is part of the cooking time has already been considered. Cook times depend on the food being cooked, how thick the meat is, cut size of foods, altitude, and the desired outcome/texture. After you make the recipe, jot any changes that you would make to the time. Time to come to Pressure - What happens? You've checked your seal, secured your lid, closed your pressure valve, pushed your pressure button, selected your time, and now what? Your cooker will say "ON"
Some wisps of steam will come out of the pressure valve. Some steam may come out of the float valve. The steam will stop once the cooker reaches pressure. Once the float pin "pops" up, your pot has enough steam to start pressure. When the cook time has ended, your cooker will BEEP. Quick Release: This means opening the pressure valve as soon as cooking time has ended. It will be very LOUD, so be prepared. If you have cats or dogs, you may want to have a treat ready, so they associate the sound of escaping steam with a pleasant reward. How to do a QR: Use the hole in the end of your plastic spoon that came with your Instant Pot to move the pressure valve to VENTING. You can use the end of a wooden spoon, chopstick or other kitchen tool until you feel comfortable opening the pressure valve with your index finger. DO NOT place your hand/finger over the pressure valve, as HOT steam can burn you. DO NOT put a towel over the pressure valve, as it will restrict the cooker from releasing pressure normally. Natural Release: At the end of cook time, do nothing. The cooker will release pressure on its own. Your display will read L0:00, L0:01, and count UP, indicating how long your cooker has been naturally releasing. Once the contents in the pot reach 145°F, the cooker will switch to Keep Warm and stay there until you open your pressure cooker. Timed Natural Release: A recipe may say 15 min NPR, which means that you do nothing for 15 minutes (NPR) and at the end of 15 minutes, you open the pressure release valve. You can set a timer at the end of the cook time and your display will count UP, showing how much time has elapsed. Controlled Quick Release: Opening and closing the pressure valve, in short spurts until you can open it all the way, is a good tip for recipes that have foods that foam while cooking. Beans, applesauce, pasta, & oatmeal are some examples. 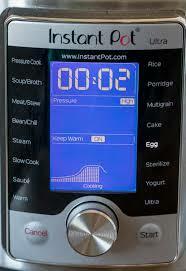 With these types of foods, Instant Pot recommends not filling the pot more than 2/3 full. If the pot is too full, or a Quick Release is used, starch and watery food can spray through the pressure release valve. Once pressure has been released, turn the lid counter-clockwise (to the left) and OPEN THE LID AWAY FROM YOUR BODY. There will be HOT steam that comes out of the pot. I know you are excited, and want to make a pot roast with veggies & gravy, but let me make a suggestion. This is a zero calorie recipe that comes highly recommended, and will only take a few minutes. It's also known as the Water Test (aka "Initial Test Run in the manual). Let you know if the cooker is working properly, and if not, contact Customer Support. Get ready to baptize your brand new baby and give it a name. No, you don't need to name it, but many folks do. It is a way to bond with your new appliance and develop a relationship. Pour 2 cups of water into the stainless steel inner pot. Put the inner pot into the pressure cooker. Firmly check the sealing ring, all around the underside of the lid. Put the lid on the cooker, rotate to close. It will Beep or chime to let you know it's closed. Make sure the power plug is securely connected and plugged in. At the end of cook time, the cooker will Beep. After about 1 minute, the float valve will drop, and you can open the lid. A good recipe to try is Hard Boiled Eggs. For eggs, there are several factors that play into the cook time: Egg size, age, amount of water used, altitude, and desired texture. Some folks like a creamy egg yolk, while others prefer a firm set yolk. You will want to start with 2-3 eggs and a room temperature Instant Pot. If your cooker is hot/warm from previous cooking, it will come to pressure faster and shorten the cooking time of your eggs. Other easy recipes to try are: Creamy Mashed Potaotes, Homestyle Mac & Cheese, Easy Cold Start Yogurt, One Pot Meat Spaghetti, Shredded Mexican Chicken, Potato Salad, or Applesauce. Follow the recipe as written for the first time. You will want to add 30 minutes to allow for prep, pressure time, as the majority of recipes only include the pressure cook time. Take notes, how long to prep, take to pressure, or simply the start/finish times that the recipe took. Jot down how it turned out and what you would do differently next time. 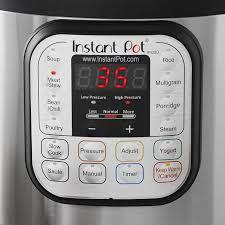 You can find a list of Authorized by Instant Pot® Cookbooks here. Stay away from "free" digital cookbooks as they are poorly written, and often have copied recipes from reputable bloggers/recipe developers. Pinterest: Use recipes from reputable bloggers. 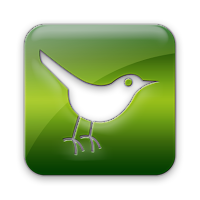 They will have social media sites with lots of interaction, help and answers to any questions you may have about their recipes. 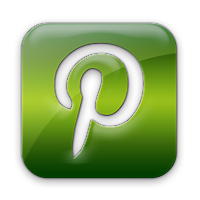 Like cookbooks, there are some Pinterest recipes that are poorly written, so use caution. Check out your local library and scan the table of contents to see if the recipes appeal to you. There's no sense in purchasing a cookbook for only a couple of recipes. Instant Pot FaceBook groups are a gold mine for recipes, and look for ones that have comments/reviews. After trying several recipes, you will gain confidence, more understanding about your pressure cookers, and be able to use them to adapt some of your favorite family recipes. You will want to wait until you browse through some favorite recipes to see which accessories you will want to use. You may even have some in your cupboard, ready to use! Tip: When shopping for accessories, you will want to note the size of your pot, or trace the circumference of the pot on a piece of paper, cut it out, fold and tuck it in your purse or wallet. You will need at least 1/4" clearance around the accessory to allow steam to reach the pressure valve. Sealing Rings: You will want at least 2 rings. One as a backup, and the other to use for spicy foods. IP FACEBOOK GROUPS - There are several groups geared toward beginners, special diets, and one that is the official group for Instant Pot. Instant Pot® Community - currently 1.6 million members strong, it's a fast moving group, so questions, posts, comments, can easily get lost and not get any responses. Use the "search this group" button, with key words in parenthesis (ie "pot roast" recipe) to find posts. 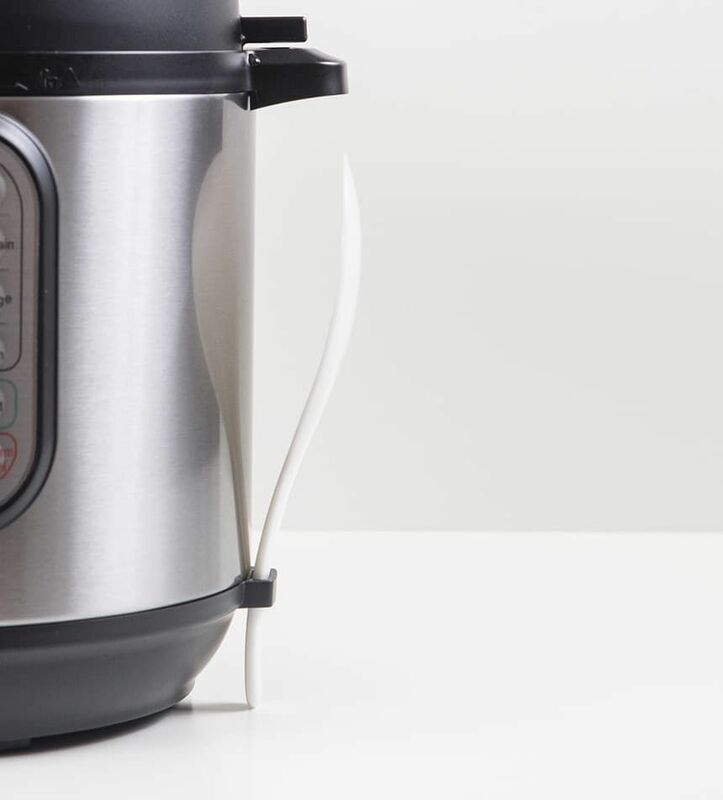 Instant Pot 101 for Beginners - with over a half million members, this smaller group focuses on helping those that are brand new to pressure cooking. Veteran cooks and bloggers are available and on hand to help out. Great information. I am including a link to this site in my RV Group presentation.